All roads lead to Rome, one of the reasons why the Roman Empire became as powerful as it did was because of their ingenious and long-lasting roads. The Romans were famous road builders.Their vast road network laid the foundations for modern day highways across Europe, with many of them being built directly over the ancient ones or running parallel to them. At the peak of the Roman Empire, the total distance that the roads covered was around 250,000 miles. With the help of this network, the Romans were able to transport reinforcements, supplies, and trade goods to even the most distant and secluded parts of their empire. The roads were also crucial for the foundation and development of many cities. People often picked roadside locations for their settlements, and some of those settlements became major cities. One such famous road that brought prosperity to a whole region, built in the second century BC, was called Via Egnatia. It connected Rome with the Eastern provinces of Illyricum, Macedonia, and Thrace. Those provinces are the territories of Albania, Macedonia, Greece and the European part of Turkey. 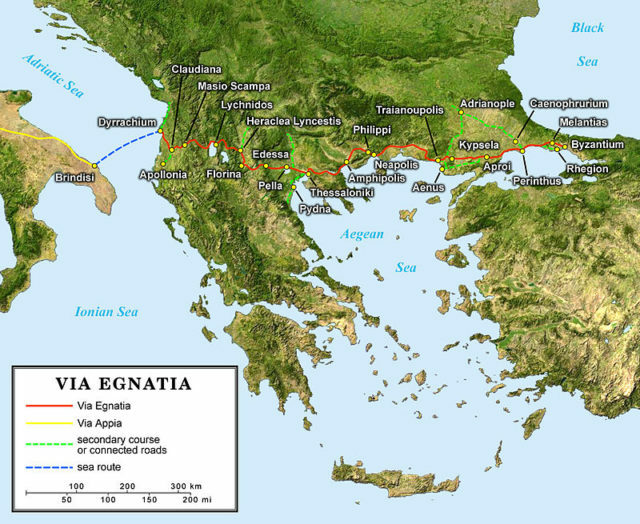 The Via Egnatia was an important part of the Roman road network mainly because it connected Rome with Constantinople (modern day Istanbul). It became a lifeline between the Western and Eastern parts of the huge Empire. The need for such a road arose with the Roman expansion towards the east. At the time before the road existed, there was no infrastructure in the newly conquered provinces and communication with Rome was hard. 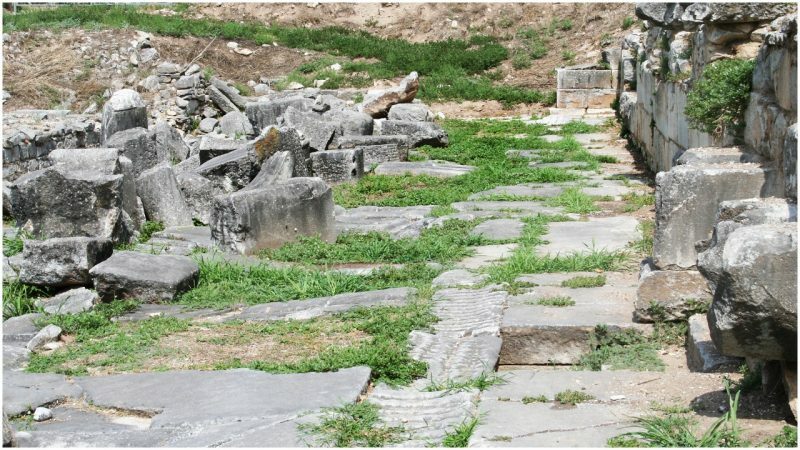 According to some written accounts, the construction of the road began in 145 BC, under the supervision of Gnaeus Egnatius, the newly appointed governor of the province of Macedonia. The road took the name of its builder. Part of the Via Egnatia in Albania. Author: Albinfo. CC BY-SA 4.0. Via Egnatia begins on the eastern shore of the Adriatic Sea, near the ancient port of Dyrrachium (modern-day Durres, Albania) and it lays directly opposite Brindisi, at the end of Via Appia. 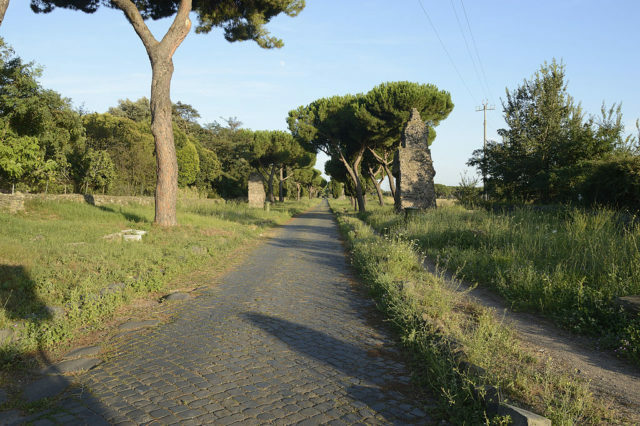 Via Appia was one of the oldest and most prestigious roads in the ancient Roman Empire which connected Rome to Brindisi, on the western shore of the Adriatic. Route of the Via Egnatia. Author: Eric Gaba / Sting. CC BY-SA 2.5. 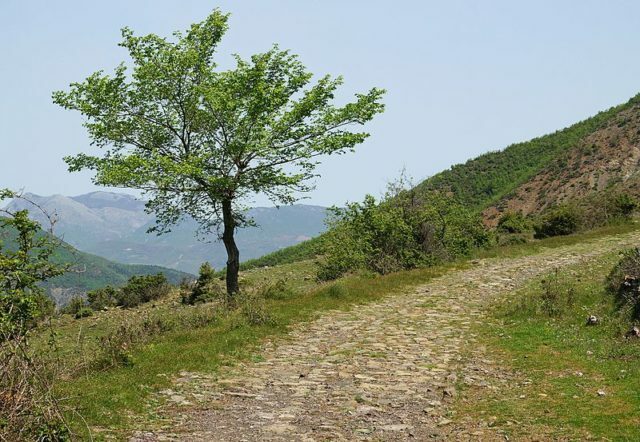 The road then followed the River Genussus (Shkumbin) and went over Jablanica Mountain, from where it descended to the shores of Lake Lychnitis (today named Lake Sevan) and it passed near the ancient town of Lychnidos (modern-day Ohrid, Macedonia). From here, the road turns south and goes over a few high mountain passes before continuing east, passing through Pella (the ancient capital of the kingdom of Alexander the Great). 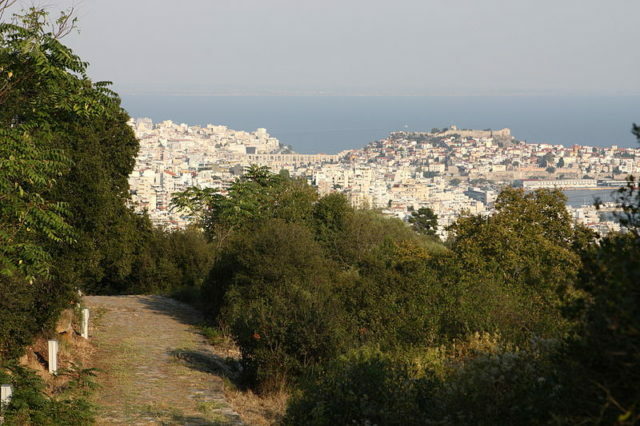 Then Via Egnatia reaches the northern coastline of the Aegean Sea at the city of Thessalonica. From Thessalonica, the road went all the way to Constantinople (Istanbul). This route is a total distance of around 695 miles. Remains of Via Egnatia near Radozda (a village on the shore of Lake Ohrid). Author: Marion Golsteijn. CC BY-SA 3.0. Since its construction, Via Egnatia played a major role in the shaping of the whole region. It was used for spreading Roman culture, religion, and shaping borders. In the Byzantine days, most of the land trade routes with Western Europe passed through Via Egnatia. Later, during the Crusades, most of the armies that traveled by land used Via Egnatia to reach Constantinople from where they went to the Holy Land. Via Egnatia has been an integral part of many historically significant moments in Roman history and has been mentioned by many historians. Paul the Apostle (Saint Paul) walked the Via Egnatia during his famous second missionary journey when he traveled from Philippi to Thessalonica. Luke the doctor, who accompanied him on his missionary journey, is assumed to be the author of the Acts of the Apostles (the fifth book of the New Testament) where this famous road is also mentioned. Via Egnatia by Resen in Macedonia, now part of A-3 motorway. Author: Petar Milošević. CC BY-SA 4.0. When Caesar’s rivalry with Pompey the Great reached its peak and a civil war broke out, both armies marched along Via Egnatia. One more exciting moment in Roman history occurred along the Via Egnatia; the forces of Mark Antony and Octavian followed Cassius and Brutus along this road to avenge Julius Caesar’s murder (the battle of Philippi). 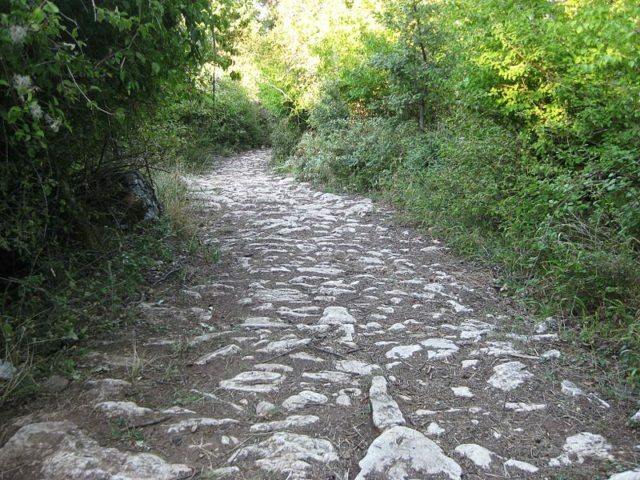 The road was also used by the Ottomans during their conquest of Europe. Ancient Via Egnatia near Kavala (Neapolis). Author: Philipp Pilhofer. CC BY-SA 3.0. We have another interesting story related to Romans: The meeting of two ancient empires: How were two Chinese skeletons able to get into a Roman cemetery located in London? Nowadays there is a highway in Greece called Egnatia Odos which runs parallel with the ancient one. 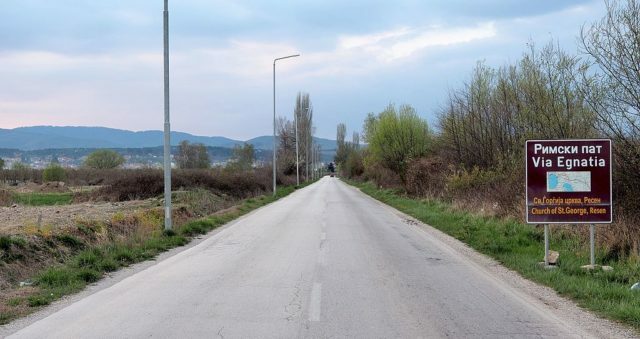 This stretch that connects Thessaloniki with the Turkish border on the Evros river carries the legacy of the Roman road builders.